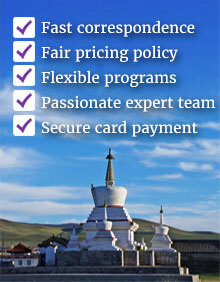 Mongolia travel | Mongolia experiential tours & holidays - Customer Feedback - Travel to Mongolia with Premium Travel Mongolia. We provide experiential & unique tours in Mongolia, organize MICE travel, and offer travel consulting service. Please take a few moments of your time to give us your opinions on the trip, you participated, so that we can continue to develop and improve and our service. Please use the following assessment grades on the whole trip. Please tick the box, which matches with your answer. EXCELLENT, everything was excellent. It was super trip in my lifetime. VERY GOOD, it was better than my expectation and thoughts. GOOD, it was what I expected; or similar to my previous experiences. NOT BAD, but, it is not fulfilled my expectation from this trip. POOR or BAD, much needed to be done to improve the whole trip. Your Guide: Please circle the rating. Your Driver: Please circle the rating. What is your opinion of the following? Please answer within the each box. If you have more to tell us, then please continue it on the “other comments “section. 3. What have you enjoyed least about your Mongolia experience? 4. Would you come back to Mongolia again for holiday? 5. Would you recommend Premium Travel to friends/ relatives? 6. In conclusion- other comments you would like to add?